The Energy Market Authority (EMA) and SP Group today awarded two Singapore-led consortiums to implement the city-state's first utility-scale Energy Storage System (ESS). CW Group and Red Dot Power will receive about $17.8 million in grants for the initiative to build this test-bed. 2. The test-bed is expected to be operational for three years at two substation locations in the north and north-eastern part of Singapore. These will have an aggregated capacity of 4.4 MWh, equivalent to powering more than 330 four-room HDB flats for a day. In Singapore, energy storage could support the deployment of intermittent generation sources like solar by reducing peak demand, and providing regulation reserves. The ESS technologies deployed, redox flow and lithium-ion batteries, will be evaluated for their performance under Singapore’s hot, and humid environment. The test-bed will also help establish clear technical guidelines for ESS deployment (e.g. grid connection and safety requirements for installation). 3. Findings from this initiative will help us catalyse the use of ESS in Singapore. Energy storage will facilitate greater deployment of solar, and help Singapore move one step closer towards the target of achieving 1GWp of solar beyond 2020, reducing our carbon footprint. 4. 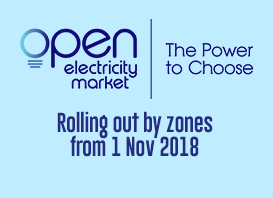 Mr Ng Wai Choong, Chief Executive of EMA, said: "Insights from this test-bed would be useful for Singapore to learn how storage could enhance the stability of our grid, provide quick response capacity and improve operational flexibility. We are also exploring how to couple energy storage with solar forecasting capabilities to enable greater deployment of solar in Singapore. " 5. "SP Group is committed to helping Singapore save energy and cost. We will adopt technology and solutions that would deliver savings. This project is a collaboration with EMA to assess how we may adopt storage to save costs." said Mr Wong Kim Yin, Group Chief Executive Officer of SP Group. 6. EMA and SP Group had earlier launched a Request for Proposal to implement a utility-scale ESS test-bed. Details of the two consortiums can be found in the Annex attached.